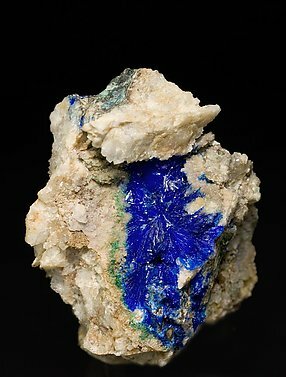 Uncommon specimen from a classic locality formed by small acicular and bladed Linarite crystals on matrix. 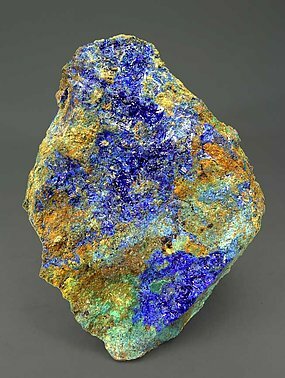 The prismatic, flat crystals with good color and brilliance are not that well defined, as is often the case with this species, which takes advantage of cracks when forming away from other copper minerals. 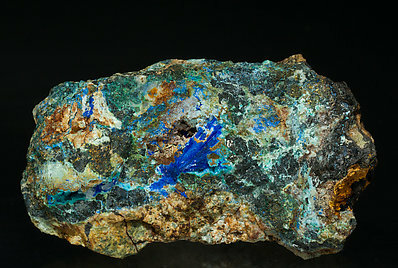 The whole sample is improved by the concretion of micro-crystals of prismatic Brochantite near the bottom of the specimen. 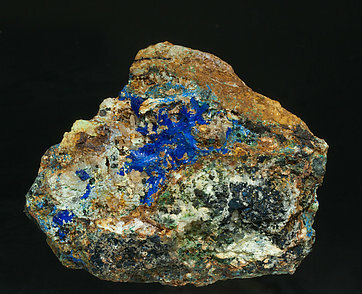 The sample is notable both for its locality and for the great definition, the size and the quality of its crystals. 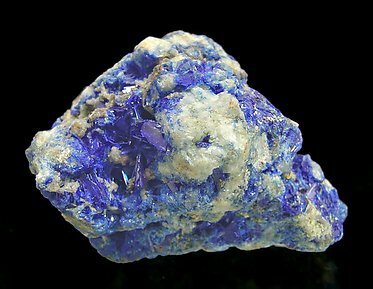 They have extraordinary luster and color and are on Quartz matrix. Crystals occupy the vugs on the clearer matrix. They are very well defined, bright and transparent. The locality is, furthermore, a classic. 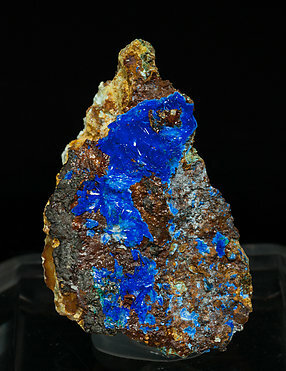 Lenticular Linarite crystals, flattened and elongated with faces and edges more defined than usual, with a very intense and vivid blue color and on a Quartz matrix. The sample is from an American locality that is a classic for the species. An infinity of fans and needles of Brochantite cover the sample with Linarite, partially covered, on a second plane. 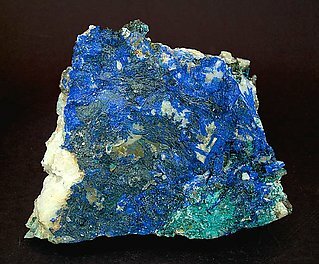 Aggregates of Linarite crystals with the flattened shape typical for the species. 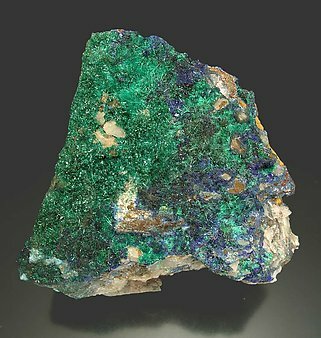 They have very intense color and luster and contrast with the deep green color of the acicular crystals of Brochantite. A novelty at Munich 2013. 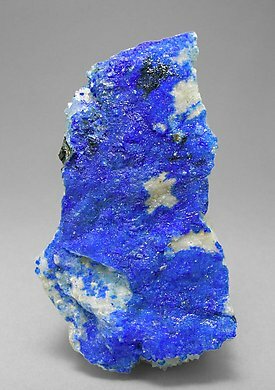 Fan-like aggregates of very well defined and bright Linarite crystals with a vivid color. They are on a limonite matrix with Brochantite. A novelty at Munich 2013. 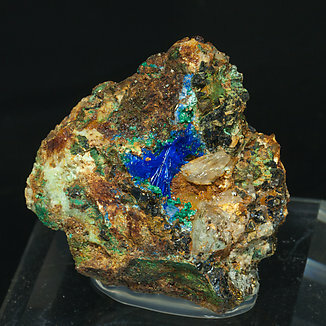 Fan-like growths of translucent and very bright Linarite crystals with a vivid color, on a limonite and Quartz matrix, with green Brochantite and Chalcopyrite. A novelty at Munich 2013. 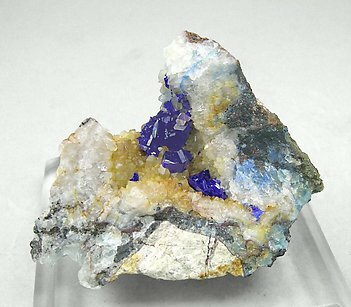 Fan-like growths of translucent and very bright Linarite crystals with a vivid color, on limonite and Quartz matrix, with clear blue Caledonite, green Brochantite, Sphalerite and Chalcopyrite. A novelty at Munich 2013. 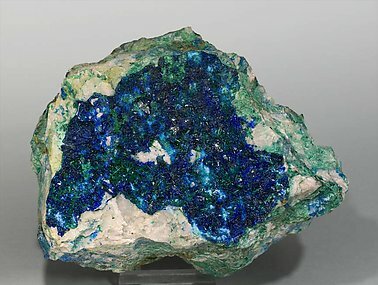 Fan-like growths of translucent and very bright Linarite crystals with a vivid color, on a limonite matrix, with green Brochantite and small Cerussite crystals. A novelty at Munich 2013. 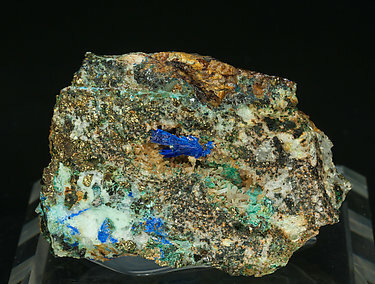 Fan-like growths of translucent and very bright Linarite crystals with a vivid color, on a limonite matrix, with Quartz and green Brochantite. A novelty at Munich 2013. 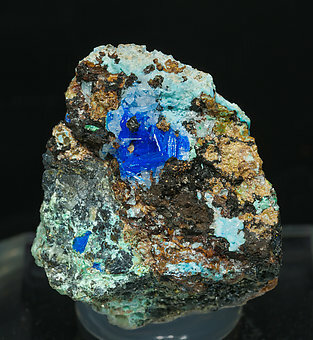 Aggregate of translucent and very bright Linarite crystals with a vivid color, on a limonite matrix, with clear blue Caledonite, green Brochantite and small Cerussite crystals. From one of the classic localities for the species. 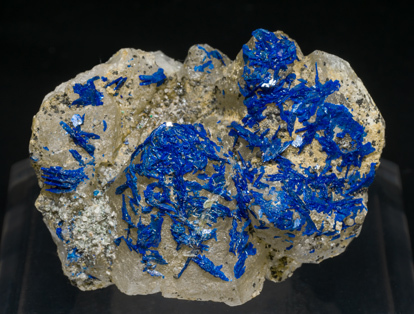 Concretions and small flattened crystals (in the vug on the back side of the specimen) with an intense and characteristic blue color, all on a Quartz matrix. Radial aggregates of acicular crystals that have extraordinary color and luster. They are on a Quartz matrix with small drops of Brochantite. The sample is numbered as 463, corresponding to an indeterminate collection.